FlightGear scenery is made up of many special binary scenery files, and constructed from many other types of (array) files. This is a windows attempt to 'visually' view such files. Of course you are 'viewing' the scenery files, in 3D, every time you run FlightGear, but here I wanted to view the contents as a 2D line drawing, using the windows native display context. Because some files can contain thousands of points, joined up into triangles and polygon, this poly-view can be quite slow. It could be sped up using either an OpenGL display, or indeed MS own DirectX technology, but that has NOT been done. --nudge=<float> = this will be applied to following files/dirs. --fg_scenery=<path> - path to FG scenery root. --fg-root=<path> - path to FG base data. --palette=<file> - palette file for map coloring. --set-spread-x=<num> - If above enables, use this spread value. --center-lon-lat=<float:float> = Center the scene on these coordinates. --disable-line-size or --enable-line-size (def) - vary line size per zoom. --disable-scenery/--enable-scenery = g_use_fg_scenery = 0/1(def). --disable-scenery-paint/--enable-scenery-paint = g_enable_scenery = 0/1(def). --enable-paint-fit-points plus --enable-paint-fit-tris, or disable (def). --verbosity=<num> - set LOG output verbosity. Default = 0. NOTE: At least one VALID file, or directory MUST be given. Further the executables are built with MSVC8 (2005) using the MS DLL runtimes (/MD and /MDd), so in certain machines they will report missing DLLS. Usually this can be fixed by downloading, and installing the appropriate runtime DLLS. 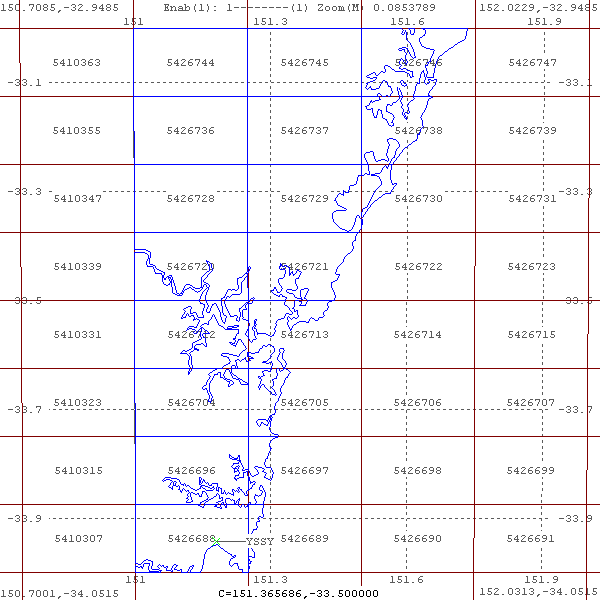 Obviously the latitude and longitude are shown, together with the index value of each SimGear 'bucket'. This is how FlightGear scenery is made up of - <chunk>/<tile>/<bucket> - although this can sometimes be written as <chunk>/<1x1>/<tile> or <index>. The <chunk> - a 10x10 degree area; the <tile> - a 1x1 degree areas - the <bucket> - the dimensions vary with latitude, but is around 1/8 of a degree square, and each buck is represented as an 'index'. You can see Sydney international airport is in 5426688. Thus that scenery would be found in the scenery folder e150s40\e151s34, in the file 5426688.btg.gz, together with e150s40\e151s34\5426688.stg file, and the actual airport YSSY.btg.gz.